It is the post-apocalyptic story of a boy and his drone. A few years ago, drones were a cause for concern among civil liberties activists, but they have apparently moved to more media-friendly causes. As a result, the field has been cleared for drone enthusiasts to rehabilitate the image of the Unmanned Aerial Vehicle (UAV). Thanks to the active collaboration of the drone community, UAVs will have their post-apocalyptic day in Rotor DR1 (trailer here), which releases today on DVD from Cinema Libre. In the future, apes will evolve from men, but before that, a catastrophic virus will wipe out most of the human population. It is a bleak world, where drones have more to fear from humans than vice versa. That is because the rag tag survivors covet the drones’ power source. Those uber-batteries are the only real currency left. Kitch (once known as Mitchell Scott, Jr.) survives by harvesting power cores and selling them to Hashtag, a dodgy intermediary working for 4C, who runs the only remotely organized outfit in the area. One fateful day, Kitch captures a drone unlike any he has seen before. That would be DR1, a next generation prototype. Out of curiosity, Kitch starts to patch it up, leading to the stunning discover that it just might hold clues to the whereabouts of Kitch’s missing and presumed dead father, Dr. Mitchell Scott. The senior Kitch was the CEO of Medix, a company that specialized in medical delivery drones and infectious disease drones. Rightly or wrongly, many survivors blame Dr. Scott for the lousy state of the world. However, Kitch is determined to track down his old man, with the help of DR1 and 4C’s rebellious niece, Maya. Although originally produced as a web-series, DR1 hangs together quite cogently as a feature. Apparently, the collective judgement of the drone community is usually pretty sound. There are a few plot holes big enough to drive a tractor-trailer through, but the aerial shots of the drones flying are impressive (frankly, the drone race is way cooler than Phantom Menace’s pod race) and the post-industrial, post-apocalyptic locales (Northeastern Ohio) truly look like a scarred wasteland. However, it seems the drone community likes its portentous narration, because there sure is a lot of it. Even though he was stuck with excessive voiceover work, Christian Kapper’s turn as Kitch is impressively complex and understated. Tom E. Nicholson also makes a strong impression as 4C—sort of like a mature, less shticky Kevin Smith, while David Windestål scores points with his “guest appearance” as the drone scientist turned drone hunter. However, it should be noted the quartet of credited screenwriters never try to invest DR1 with a personality (a la Number 5 in Short Circuit). The implications of that are admirably realistic, but not particularly cinematic. Regardless, it is nice to see a pro-science science fiction movie, especially one that falls within the post-apocalyptic subgenre. This might be the first film of the decade that does not demonize pharmaceutical companies, which certainly distinguishes it from the field. In many ways, it is an intriguing speculation on the future of UAV and AI technology. 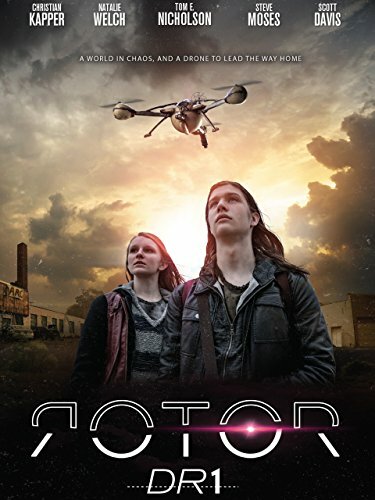 Recommended for fans of apocalyptic science fiction and the drone pilot reading over your shoulder, Rotor DR1 is now available on DVD and BluRay, from Cinema Libre.